"A tangy and sweet orange mocha." 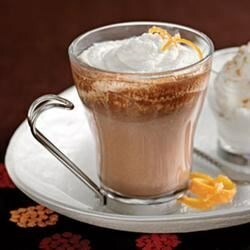 Stir coffee, orange juice, milk, sugar, and cocoa powder together in a mug until the sugar and cocoa dissolve. I used orange juice concentrate for more orange flavor. Interesting mocha. I don't think I would use cocoa powder if I made it again, I would use cocoa mix or chocolate syrup. it was interesting flavor, i would make it a couple more times but its not a favorite.